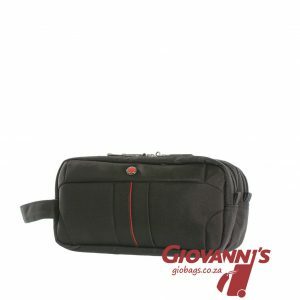 The K-940 Troop London Toiletry Bag is a soft allure that suits your everyday need. Simply crafted as an easy go-bag, it serves diverse purposes in its usage, keeping all your cosmetics and bathroom essentials in one place. Take it with you to anywhere–its portable size easily fit in any travel bag. Made from super strong PU with a Matt Suede finish. 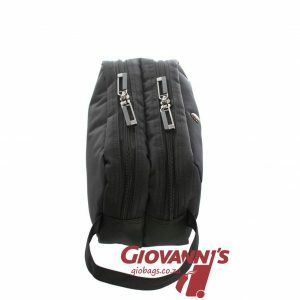 It features a single main zippered compartment that opens widely to a interior that is fully lined with water resistant lining. The wideness also allows for easy access. A zip pocket and two smaller pockets are on the inside and an external zippered slip pocket lets you pack extra. The sturdy hand strap by the side ensures a good grip. Smart Design: Spacious enough to carry what you need on-the-go; keeps your items neatly organized. It’s an elegant and stylish choice for those cosmetics and bathroom essentials. Material: Super strong PU with Matte Suede finish. Features: Exterior – hand strap and a front zip pocket. Interior – Full lining; a main compartment with a zip pocket and 2 smaller pockets; and a large zip pocket on the back wall.